Don’t Look Up: Would Traffic Signals in the Pavement Protect NYC Phone Gazers? We’ve already seen the creation of texting lanes for smartphone addicts (in Antwerp, Belgium and Chongqing, China) so pedestrians don’t have to be stuck behind someone hunting for the perfect emoji. 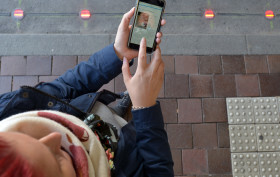 Recently the German city of Augsburg has taken the step of actually installing traffic lights in the pavement so text-walkers could be made aware of when it’s unsafe to walk–by which we mean they’re about to walk into the path of a 50-ton train. The idea came about after a 15-year-old girl was fatally hit by an oncoming tram while wearing headphones and looking down at her smartphone. As reported in The Telegraph, the lights look like ordinary road markers, but flat to the ground. Bavarian public-works/transportation provider Stadtwerke Augsburg has installed the experimental earthbound traffic signals in two rail stations. The LED lights blink green when it’s safe to walk and red when a train is approaching. They’re visible from a distance, so they might even give pedestrians some lead time to realize an intersection is up ahead. Wasn’t it just miserable getting to work this morning? Trying to walk, balance the umbrella, and text all at the same time? Thankfully, there are some people out there who understand this painful situation, like the folks over at Korean-based company kt. The wireless telecommunications giant developed the phone-brella, which, according to designboom, has “an ergonomic C-shaped handgrip that’s placed around the user’s wrist. The bottom half of the C pins acts as a counter-weight, balancing the object and helping the shoulder prop it up,” leaving both hands free to text away. You’ve seen them. You’ve tried to get around them. You’re probably one of them. In a world where there are more mobile phones than people, it’s become commonplace to find folks paying more attention to what’s on their phones than what’s in front of them on the street. These so-called “text-walkers” are often a nuisance to other pedestrians as well as a danger to themselves (and their precious phones). 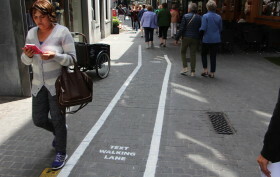 A smart solution to this problem has appeared on the sidewalks of Antwerp, Belgium in the form of “text walking lanes.” These lanes, marked by simple white lines painted onto the sidewalk, designate a separate walking space for people who use their phones while walking.